Roger Federer is playing so well he's trying trick shots that didn't work for him the last time. The top-ranked Federer prolonged his career-best winning streak to 38 matches and advanced to the quarterfinals of the Dubai Open with a 7-5, 6-3 victory over Italy's Daniele Bracciali on Wednesday. Federer saved break points in the third and fifth games and broke Bracciali at 6-5 for the first set. In the second, the Swiss star went up 3-0 and had the confidence in the seventh game to run down a lob and hit it between his legs for a winner while the Italian stood at the net. "I have had great shots over the years, and that was definitely one of them. 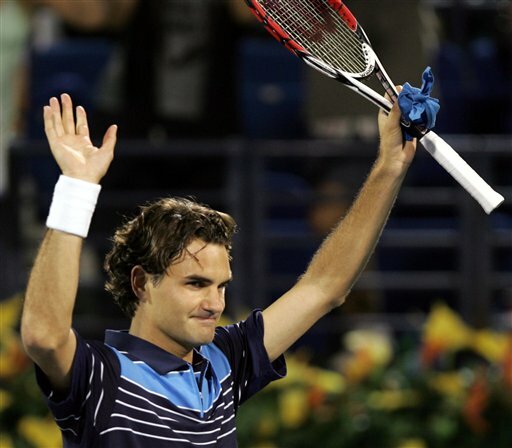 Through the legs, from very far back in the court for a winner," Federer said. "Probably the last time I attempted it was on match point against (Marat) Safin at the (2004) Australian Open and I failed. "After messing that shot up, I never thought I am going to do it again. But anyway, I knew I had it in the bag and pulled it out tonight." Defending champion and second-ranked Rafael Nadal edged Igor Andreev of Russia 6-2, 3-6, 7-6 (2). Also advancing to the quarterfinals were fifth-seeded Tommy Haas, No. 7 Novak Djokovic and 2002 champion Fabrice Santoro. However, No. 3 Nikolay Davydenko of Russia and No. 6 Tomas Berdych of the Czech Republic were bounced out of the second round. Nadal, taken to three sets by Marcos Baghdatis on Tuesday, met Andreev for the first time since 2005, when the Russian was the last man to beat Nadal on clay. Nadal has since gone a record 62 matches unbeaten on dirt, and appeared to be cruising on the desert hardcourt when he had triple break point on Andreev at 6-2, 3-3, 0-40. But Andreev held, then broke Nadal for the first time, served out the second set, and broke the 20-year-old Spaniard to start the third. Nadal immediately tied the score and they held service to the tiebreaker, in which he surprisingly jumped to 5-1 lead and won it 7-2. "He is a very tough opponent. I lost to him two years ago on clay in Valencia, so I knew I needed to play a very good match to beat him," Nadal said. "Winning the third set in a tiebreak was very important for my confidence. I have had two good tough matches now after the monthlong break." Next for Nadal was another Russian, Mikhail Youzhny, who topped Berdych 7-6 (6), 6-3 for the second time in two weeks. Olivier Rochus of Belgium upset Davydenko 4-6, 6-4, 6-2 for the first time since 1999, when they played on the minor tours. Florent Serra of France spoiled his 26th birthday when he double-faulted on match point and lost to Haas 7-6 (5), 6-3. Haas was quickly wearing off his jetlag. After he beat Andy Roddick in the Memphis final on Sunday, he didn't arrive in Dubai until 3 a.m. Tuesday. By that evening he was winning his Dubai debut against Radek Stepanek, and was ready for Serra on Wednesday. "I only got four hours sleep and was up again at 5.30, but it's going to take a tough opponent to beat me," said Haas, scheduled to play Rochus next. Djokovic beat German qualifier Rainer Schuettler 7-6 (5), 6-3 and lined up Federer, whom he hadn't beaten in three matches. Fabrice Santoro defeated Gilles Simon 6-4, 6-2 in the first meeting between the Frenchmen. Santoro was to meet Robin Soderling after the Swede won for the first time in four matches with Dominik Hrbaty of Slovakia, 6-3, 7-5.